Strut Pro Individual Kits are normally ordered for a single size bearing. This is where you as a boat owner or shop owner can utilize the benefits of the tool without needing to purchase unnecessary extra components. The Individual Kit can be upgraded for different size shafts and bearings by adding the required horseshoes and collets. There are many combinations, therefore it is very important to know your shaft and bearing diameter measurements before ordering. We pre-size all parts so you get the correct fit for your bearing. All sizes are shown by a part number that includes a name commonly associated with that bearing size. Installing the new bearing is accomplished by only reversing the horseshoes. Read the Owners Manual and view the video which is available from our website home page. This will familiarize you with the procedure. Always call us if you have questions. 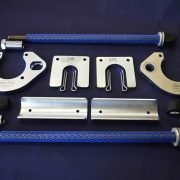 Individual Kits includes the tool assembly with all accessories needed to replace a strut bearing with a 3/4″ shaft (i.d.) x 1-1/4″ bearing o.d. x 3″ long. Two yokes with threaded rod assemblies, 2 horseshoes, shaft spacers and collets to fit 7/8″ shaft x 1-1/4″ bearing o.d. Two yokes with threaded rod assemblies, 2 horseshoes, shaft spacers and collets to fit 7/8″ Shaft x 1-3/8″ bearing o.d. Two yokes with threaded rod assemblies, 2 horseshoes, shaft spacers and collets to fit 7/8″ shaft x 1-1/2″ bearing o.d. Individual Kit Includes all components to remove and install the strut bearing for the propeller shaft and bearing diameter shown. Two yokes with threaded rod assemblies, 2 horseshoes, shaft spacers and collets to fit 1″ Shaft x 1-1/4″ bearing o.d. For removing and installing Cutless bearings. Two yokes with threaded rod assemblies, 2 horseshoes, shaft spacers and collets to fit 1″ Shaft x 1-1/4″ bearing o.d. x 6″. Two yokes with threaded rod assemblies, 2 horseshoes, shaft spacers and collets to fit 1″ Shaft x 1-3/8″ bearing o.d. Two yokes with threaded rod assemblies, 2 horseshoes, shaft spacers and collets to fit 1″ Shaft x 1-1/2″ bearing o.d. Two yokes with threaded rod assemblies, 2 horseshoes, shaft spacers and collets to fit 1″ Shaft x 1-5/8″ bearing o.d. Two yokes with threaded rod assemblies, 2 horseshoes, shaft spacers and collets to fit 1″ Shaft x 2″ bearing o.d. Two yokes with threaded rod assemblies, 2 horseshoes, shaft spacers and collets to fit 1 1/8″ shaft x 1-1/2″ bearing o.d. Two yokes with threaded rod assemblies, 2 horseshoes, shaft spacers and collets to fit 1 1/8″ Shaft x 1-5/8″ bearing o.d.